Sturge- Weber syndrome More Details More Details occurs sporadically with a frequency of 1 in 50,000. It is characterized by meningofacial angiomatosis with cerebral calcification. Klippel-Trenaunay syndrome is characterized by a triad of cutaneous vascular malformation along with bony or soft tissue hypertrophy and venous varicosities . Phakomatosis pigmentovascularis is a distinctive association of cutaneous hemangiomas and melanocytic nevi. A ten-month-old male child presented with developmental delay, reduced vision and right-sided focal seizures. A similar episode of seizure was reported one month back. He was the first born child of nonconsanguineous marriage. There was no significant family or birth history. The developmental milestones were delayed. On examination, his weight was 9.3 kg (25 th percentile), height was 72 cm (25 th percentile) and head circumference was 52 cm. (>95 th percentile, macrocephaly). Developmental assessment revealed a global developmental delay as he could not sit without support, had an absent palmar grasp, monosyllabic speech, would not smile at mirror image, or play with ball. There was a port-wine stain on his face and hyperpigmented lesions over trunk, abdomen and right leg as seen in [Figure 1] suggestive of dermal melanocytosis. Hyperpigmentation on the left cornea and facial skin were suggestive of oculocutaneous melanosis (nevus of Ota). He had megalocornea and bilateral buphthalmos. His right lower limb was hypertrophied. Calf circumferences of right and left lower limb were 20.6 cm and 18.5 cm, respectively, thigh circumference of right and left lower limb were 26.5 cm and 25.3 cm, respectively, foot length of right and left lower limb were 137.91 cm and 124.21 cm, respectively. Figure 1 :Showing hyperpigmented lesion on right leg and trunk. The computerized tomography (CT) scan of brain of the patient as seen in [Figure 2] showed generalized atrophy of brain along with generalized hyper dense area in white matter mainly in frontal lobe and left parietal lobe. Dystrophic calcification suggestive of chronic congenital ischemic change due to venous malformation was also noted. There was mild post contrast enhancement in the left parietal-occipital region. Ultrasound of abdomen did not show any vascular and renal anomaly. As the child had both the features of Sturge-Weber syndrome and Klippel-Trenaunay syndrome, a diagnosis of an overlap syndrome was made. 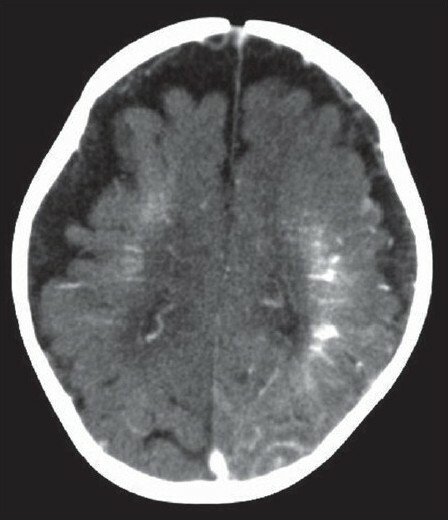 Figure 2 :CT of head showing atrophy of brain and calcifi cation of left parietal region. Sturge-Weber syndrome is a mesodermal phakomatosis characterized by port-wine naevus covering face and cranium supplied by first division of trigeminal nerve along with atrophy and calcification of cerebral hemisphere homolateral to the skin lesion. This syndrome occurs sporadically with a frequency of approximately 1 in 50,000. Sturge-Weber syndrome is associated with glaucoma, seizures, paresis, and neurodevelopmental delay. About 70% of patients with epilepsy have their first seizure within the first year of their life. Neuroradiological findings in these patients show leptomeningeal enhancement along with signs of cortical atrophy and calcifications in the subjacent area. In our patient, the central nervous system abnormalities on CT scan along with the port-wine stain, glaucoma, seizures, and developmental delay pointed to Sturge-Weber syndrome. But the right leg hypertrophy, extensive cutaneous vascular lesions and macrocephaly could not be explained by Sturge-Weber syndrome alone. Klippel-Trenaunay syndrome is a rare entity characterized by the combination of capillary nevus, early onset of varicosities and hypertrophy of tissues and bones of the affected limb. Cutaneous lesions can occur in any area, but are more commonly located on the legs, buttocks, abdomen and lower trunk. The varicosities in Klippel-Trenaunay syndrome appear in most patients by the age of 12 years. Central nervous system abnormalities associated with Klippel-Trenaunay syndrome include microcephaly, macrocephaly, cerebral arteriovenous malformations, spinal arteriovenous malformations, and orbito-frontal varices. Our patient had leg hypertrophy associated with ipsilateral cutaneous vascular malformations and macrocephaly, which are features of this syndrome [Figure 3]. Phakomatosis pigmentovascularis is characterized by the association of extensive nevus flammeus and pigmentary nevi in the form of widespread, aberrant and persistent Mongolian spots. There are four types of phakomatosis pigmentovascularis all having nevus flammeus as a component. Along with nevus flammeus, type I has an epidermal nevus, type II has blue spots with or without nevus anemicus, type III has nevus spilus, with or without nevus anemicus, type IV has blue spots and nevus spilus with or without nevus anemicus. The findings in our patient are in accordance with type IIa, according to the classification of phakomatosis pigmentovascularis. Over 40 reports of patients with overlap of Klippel-Trenaunay syndrome and Sturge-Weber syndrome have been published. Neuroradiological studies have been performed only in few such studies. ,,, The CT scan abnormalities of central nervous system noted in them were malformation of the circle of Willis, cerebral hemihypertrophy, aplasia of the cervical internal carotid artery, cerebral atrophy, prominent choroid plexus, cerebral calcifications, leptomeningeal enhancement. Only in few patients, typical intracranial findings as seen in Sturge-Weber syndrome were seen. There is no specific curative treatment for this combined disorder. The management is directed towards underlying systemic and local anomalies. Our case represented an overlap syndrome between Klippel-Trenaunay syndrome and Sturge-Weber syndrome in association with phakomatosis pigmentovascularis, which to the best of our knowledge has been reported in very few earlier studies ,, and has not been reported from India. 1. Kiley MA, Oxbury JM, Coley SC. Intracranial hypertension in Sturge- Weber/Klippel-Trenaunay-Weber overlap syndrome due to impairment of cerebral venous outflow. J Clin Neurosci 2002;9:330-3. 2. Rahman M, Rahman S, Rahman M, Akhter S, Kawser C. Overlapping of Sturge Weber syndrome and Klippel Trenaunay Weber syndrome. Mymensingh Med J 2008;17:78-81. 3. Verhelst H, Van Coster R. Neuroradiologic findings in a young patient characteristics of Sturge-Weber syndrome and Klippel-Trenaunay syndrome. J Child Neurol 2005;20:911-3. 4. Berry SA, Peterson C, Mike W. Klippel-Trenaunay syndrome. Am J Med Genet 1998;79:319-26. 5. Hall BD, Cadle RG, Morill-Cornelius SM, Bay CA.2007. Phakomatosis pigmentovascularis: Implications for severity with special reference to Mongolian spots associated with Sturge-Weber and Klippel-Trenaunay syndromes. Am J Med Genet Part 143:3047-53. 6. Lee CW, Choi DY, Oh YG, Yoon HS, Kim JD. An infantile case of Sturge-Weber syndrome in association with Klippel-Trenaunay-Weber syndrome and phakomatosis pigmentovascularis. J Korean Med Sci 2005;20:1082-4. 7. Saricaoπlu MS, Gόven D, Karakurt A, Sengun A, Ziraman I. An unusual case of Sturge-Weber syndrome in association with phakomatosis pigmentovascularis and Klippel-Trenaunay-Weber syndrome. Retina 2002;22:368-71. 8. Vissers W, Van Steensel M, Steijlen P, Renier W, Van De Kerkhof P, Van Der Vleuten C. Klippel-Trenaunay syndrome and Sturge-Weber syndrome: Variations on a theme? Eur J Dermatol 2003;13:238-41. 9. Shin SS, Kim SJ, Lee SC, Won YH. A case of phakomatosis pigmentovascularis type IIb associated with perirenal lipomatosis. Korean J Dermatol 1999;37:1069-73. Ruiz Villaverde, R. and GalÃ¡n Gutierrez, M. and Sierra CÃ³rcoles, C.